Over the past eight years of my road cycling journey I’ve always ridden one of the major bicycle brands. While the innovation and testing is unparalleled to most, there’s always that fluttering thought in the back of my head that recognises I’m riding a mass-produced bike. Yes, it’s stiff, fast and it looks good, but the terms craftsmanship and custom certainly don’t resonate. After gazing at the Stinner a number of times during a visit to my local bike shop, I finally got the go ahead to take this eloquent machine out for a spin. 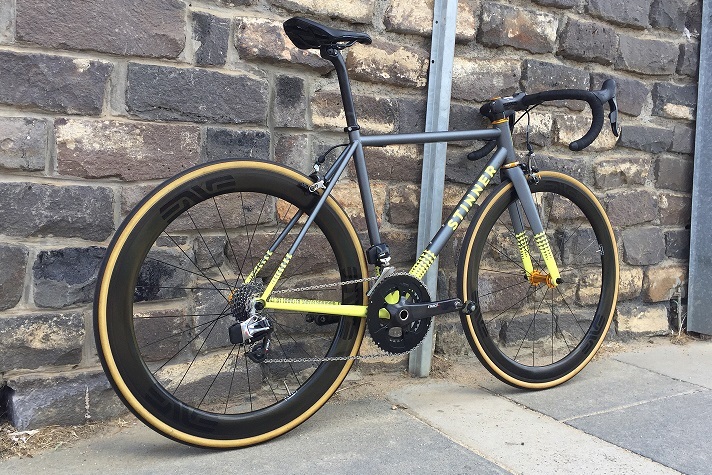 Built by the guys at Hampton Cycles, the beauty of the Stinner goes far beyond its efficacious demeanour. Here are three good reasons why the Stinner should be on your shopping list. Bike manufacturers have a tough job in front them. They operate in a highly competitive environment with a need to update a bike’s geometry roughly every two to three years and its look and feel every twelve months. Sometimes I question how they have made improvements from one model to another. Part of me wonders if the traditional road bicycle has been over engineered in an attempt to look meaner, creating a stiffness that has crossed the line of necessary. When laying eyes on the Stinner, you immediately get drawn into its simplicity, beauty of precision and hand craftsmanship. The welding creates a synergistic feel across the entire frame and a close and passionate eye has clearly administered the paint job. With the addition of Sramm eTap and some eye catching Enve wheels, the bike is a standout to a trained eye. This was the second time I had ridden a steel bike. 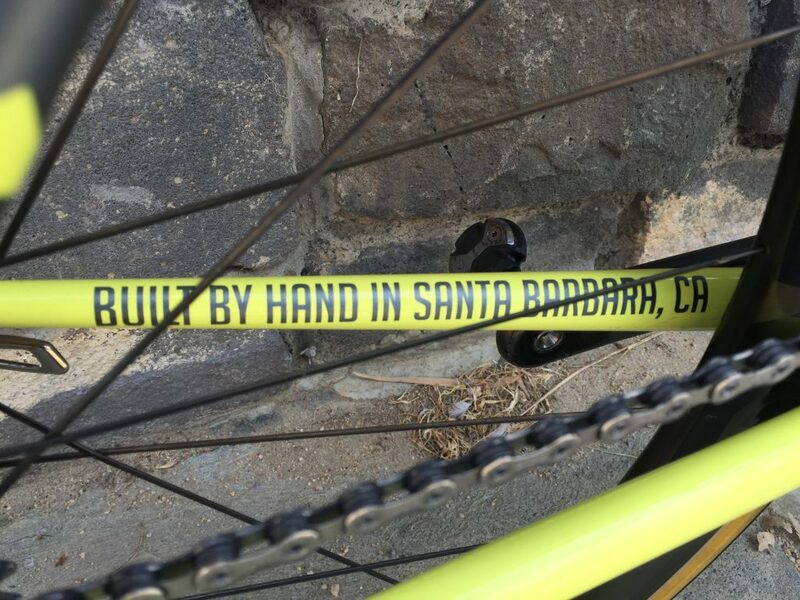 While some would question the material – particularly if you’re a fanatical hill climber – the quality of the steel tubing Stinner uses means you only gain about half a kilo. The bike’s ability to absorb and cushion the road was perhaps my biggest highlight. The stiffness that many bike manufacturers go for today means you lose that comfort level – perhaps we’ve all forgotten what it’s really like to ride a comfortable bike? With the Stinner it felt like I could ride until the cows come home. The Beach Road section in Melbourne I have ridden across thousands of times before felt like a new patch of bitumen. While riding the Stinner I was questioning why many of us have become so obsessed with stiff race bikes. 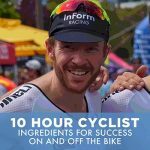 How often do you actually race a bike, and then, how often do you get out of the saddle and sprint has hard as you can? If you broke that down to a percentage of your overall riding, if may provoke questions as to why you’re riding a race bike at all. Having said that, the Stinner itself has superb cornering ability and the out of the saddle movement feels natural, the way it should be. One of Melbourne’s cycling personalities once said to me “small, medium and large, what are we ordering here, pizza?” We can all summarise our appetites into certain categories but our physical make up can vary significantly, especially when you consider variables such as leg and torso length, flexibility and discrepancies between parts of your body. 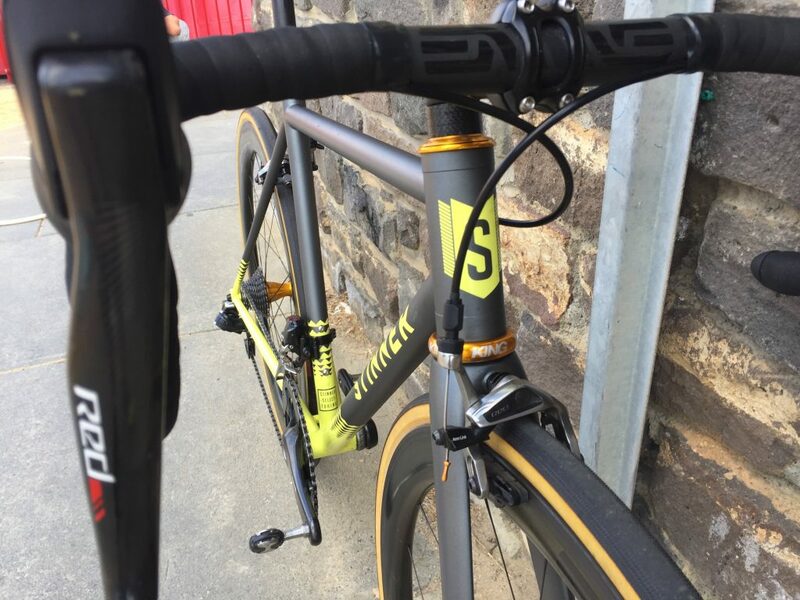 Stinner not only align their frame build exactly to the rider, they also provide a comprehensive design service. As a result, the bike you end up with not only aligns to your physical needs, it also captivates you in a way which meets the colour and design palate. Reading other reviews and hearing general feedback in the market, it seems apparent that Stinner treats this design process with the level of detail and service that ensures a strong emotional attachment to the bike before it’s even ridden. If I had to give the Stinner a rating out of 5, I’d have to say 5. Perhaps I was over-spoilt with the Enve wheels and the Sram eTap components, but the level of comfort and the beauty of the frame left me with no opportunities to find gaps in a beautifully crafted bicycle. I love steel bikes and would never ride anything else. The Stinner looks very well built! I have been riding my Stinner Gibraltar for 2 years and love every moment in the saddle. From the design process initiated with a phone call, to the final paint and prep; Stinner makes you a creative partner in the process. Craftsmanship is superb, and the ride is sublime. steel or stainless steel option?